The ski resort of Sierra Nevada is located in the Penibetic mountain ranges of Andalusia, in the natural park of Sierra Nevada - Granada, surrounded by the provinces of Malaga, Almeria and Jaen. Sierra Nevada is one of the best ski resorts in Spain to practice your favourite snow sport due to its pleasant climate, in addition to its altitude, being the highest resort in Spain, with the Pico Veleta just over 3300 meters and the Mulhacen at 3480 meters. To enjoy the slopes and the station, you have to get to Pradollano, the centre of Sierra Nevada, from where you have access to all types of establishments: Restaurants, cafes, bars, hotels, gift shops, equipment rental shops for ski and snowboard, storage room, ski pass purchase and access to the cable car to the Borreguiles slope or chairlift to other slopes. During the winter season Sierra Nevada offers 116 ski slopes, with 4 levels of difficulty, a total of just over 100 kilometres of slopes. And during the summer it is a fabulous natural area where to enjoy different hiking trails. If you need a means of transport to get to this destination, check our transfer services in Malaga, or enjoy a day in Sierra Nevada with excursions from Malaga we provide. What to do at the ski resort? 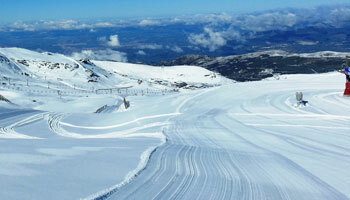 Skiing in Sierra Nevada: It is undoubtedly one of the favourite activities for visitors. The slopes are in perfect condition for skiing, regardless of the level of the skier. Also with a special pass you can ski the River slope- from Borreguiles to Pradollano some Saturday nights, from 7 to 9.30 pm; a fantastic opportunity for those who always wanted to practice night skiing. 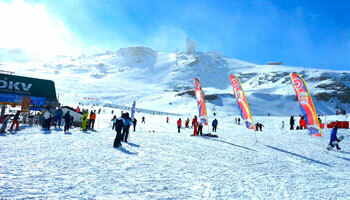 Snowboarding in Sierra Nevada: This is the other favourite sport in Sierra Nevada. 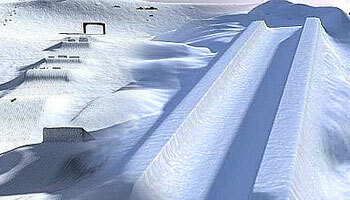 The climate and the large number of slopes allow snowboarders to fully enjoy this activity. Whether it's skiing or snowboarding, you can hire a monitor or conduct training courses for amateurs or people with more expertise in the discipline. 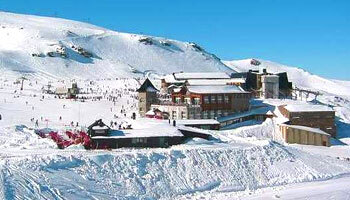 Super Sulayr Park, a place prepared expressly for experts and reckless skiers. Perfect for extreme forms of snow sports, to the limit, in a half-pipe of 6 meters height or several areas of Freeride, both options appear to be very spectacular, where you can watch the most skilful doing fascinating jumps and spins. High Performance Centre: Many athletes visit the High Performance Centre in Sierra Nevada; athletes have the opportunity to practice their sport at high altitude with its unique advantages. Play and entertainment area of Mirlo Blanco: The smaller ones, the less skilled or those fearful of getting injured on the slopes during the descents, also have their place. Mirlo Blanco is all fun with the slides, Russian sledge, chairski, minisnow, miniski, archery, bike slalom and other activities. Ice skating: Next to the area of Mirlo Blanco there is an artificial ice rink. Driving a snowmobile: Another alternative in Sierra Nevada is to join guided tours on snowmobiles, which are organized on different dates during winter; this kind of experience is increasingly requested. Hiking in summer: You can also enjoy the incredible natural setting of the Sierra Nevada Mountains with hiking trails. Regardless of the season, you will be surprised positively hiking in the mountains, a healthy and highly recommended activity. When our customers do not need an excursion, however they want to travel to the destination of Sierra Nevada, we advise to take note of services that we provide with Taxis Malaga airport to Sierra Nevada, the best way of transport, without a doubt.